Ancient Andean wisdom teaches us that the earth was made while the creator sang, thus all beings are made of sound, rhythm and harmony. Through his concerts, flower ceremonies and music classes La Rosa helps reawaken our memories (memoria antigua) - weaving sounds into frequencies that open the heart and encourage the spirit to soar. La Rosa, a descendant of Quechua Indians of the Peruvian Andes, has spent more than a decade recovering and preserving, studying, and intuiting the ancestral music of Peru. 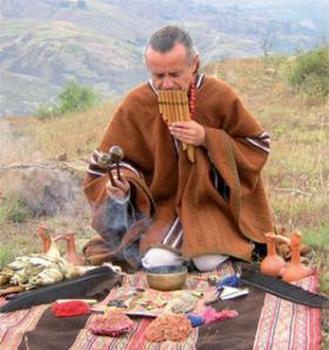 Tito is a Curandero de Sonido – sound healer. When performing ritual and ceremony for healing, he enters into parallel worlds to bring forth sound that elevates the vibration of an individual and allows for healing and balance to occur. 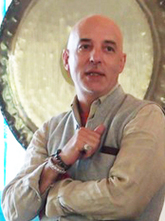 Richard Rudis Sonam Dorje will teach his class on the Tibetan principles of Sacred Sounds, this workshop is an immersion in the sacred sound applications and practices of the gong. How Gong tones can heal and transform. Workshop participants will personally explore vibrational healing techniques, history and Dharma teachings while using these remarkable instruments. Rudis said beliefs in the spiritual and physical power of sound are not unique to Tibetan Buddhism but are a part of many cultures and traditions. Even the command "Let there be light" in Genesis can be seen as part of that power, he said. "It's the thought of utterance, that divine vibration, that is the source of the universe. The Earth itself vibrates at a primal level as it spins on its axis, emitting a G, and revolves around the sun, emitting a C-sharp, Rudis said. "If you pronounce the syllables, you can feel your whole body vibrate. There's physical associations with all these tones." Richard Rudis created the first original Gong Bath™ experience twenty years ago and has performed over 1,000 Gong Baths in the US & internationally helping well over 35,000 participants. Using principles of Vajrayana Buddhism, specific sacred geometry, mathematics & instrumentation a dynamic meditative experience is created where each participant is acoustically guided, via harmonic overtones, into realms of physical well-being, emotional balance, cellular healing and spiritual awareness. Carefully designed vibrational constructs are used to further entice the brain into Alpha/Theta/Delta wave-scapes of creativity, relaxation and enrichment. 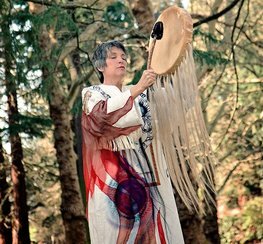 A sound healing pioneer with thirty years of Buddhist scholarship. 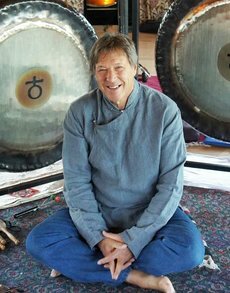 His extensive collaboration with other sound healing researchers and studies in Eastern energy healing have resulted in the development of a unique sacred sound healing technique known as a 'Gong Bath™, holding the trade mark since 2008. Currently he is writing a book on this subject including specialized playing techniques and supportive philosophies. (see; https://www.youtube.com/user/Sonamdorje for video tutorials and www.sacredsoundgongbath.com for further details). Philippe Pascal Garnier, will be presenting a master class on Crystal Singing Bowl to discover the optimal use of these very special vibrational instruments. We will learn about the natural affinity and resonance we hold within our crystal core consciousness and how the crystal bowl can be integrated into our life's blue print as well as for the use of professional practice to enhance therapeutic outcomes. During class we will also learn how to play Crystal Singing Bowls and methods of using them during sessions as well as in performances. ​Sage Academy Of Sound Energy, Center For The Healing Arts. LEA GARNIER: LOVE. PEACE. SHRUTI Lea Garnier will Demonstrate how to use a SHRUTI BOX for your personal practice, for use in therapeutic settings such as a yoga class, group sound healing or in a private healing session. The Shruti Box originates from India, and is fast becoming an essential part of the sound practitioner’s “kit” as one of the main tools used in facilitating a sound journey. At the same time it provides a personal deep healing for our throat chakras as it teaches us the many ways to liberate our voice. Students will have the opportunity to practice, as each will be provided a shruti box to use during this teaching. IN THE YOGA OF SOUND Lea will guide you through a morning sadhana, using gentle yoga, yin style with the sounds of the sacred sound instruments. MENLA Center for Health And Happiness, information & direction to MENLA Center, a stunning venue.